Of the many errors and misconceptions surrounding the rhino horn trade, perhaps the most oft-cited one is this: it’s all the fault of the Chinese. Read the studies, speak to the experts, move away from knee-jerk reactions and the truth is that China is not the number one culprit. Yes, there was a time when it was seen as a virtual panacea. Li Shizhen’s 1597 Bencao Gangmu prescribed it for almost everything: from “devil possession” to “typhoid, headache and feverish colds”, “carbuncles and boils full of pus” and “arthritis, melancholia, loss of the voice”. Yet rhino horn was struck from China’s official pharmacopeia in the early 1990s, and has been banned in China since 2003. Both the wildlife trade-monitoring network TRAFFIC and WWF have noted the country’s progress in controlling the rhino horn trade. Today, Vietnam controls the market for roughly two-thirds of the trade. This is not to say that China isn’t involved: much of the remaining third is used inside the country. But Vietnam’s population is a little under 89 million. China’s is over 1.3 billion. Comparatively, in other words, China has things under control. “Per capita the market in China is absolutely minuscule”, says Peter Knights of the conservation group WildAid, which is spearheading a new campaign aimed at ending the trade for good in China and Vietnam. These days, however, there is much less horn to consume. 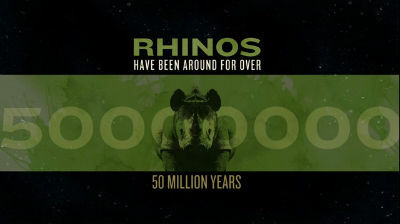 At the beginning of the 20th century there were 500,000 rhinos across Africa and Asia. By 1970 there were just 70,000. Today, fewer than 29,000 rhinos survive in the wild. Despite the minuscule numbers remaining, the trade in rhino horn is booming. Poachers in South Africa killed just 13 rhinos in 2007. By 2011, that number rose to 448. Last year, 668 were slain. If the numbers carry on at this rate, many experts say, the black rhino could be headed for extinction in South Africa by 2016. Why the focus on South Africa? Vietnam’s Javan Rhino went extinct in 2011. Four of the last seven Northern White Rhino (and the only ones able to breed) are under 24-hour armed guard in Kenya’s Ol Pejeta conservancy, making them officially the rarest mammal in the world. This leaves 80% of the world’s remaining rhino in South Africa, and it is here that the majority of the poaching is happening. As a result, significant public awareness campaigns are finally taking place in South Africa. These initiatives are focussed on protecting what remains, funding patrols, and providing education and alternatives to those who might be tempted to risk their lives to poach a horn. What they do not do is address demand. This is where WildAid’s campaign comes into play. Under their slogan “When the buying stops, the killing can too”, the organisation is attempting to quell public support for all aspects of the illegal wildlife trade: rhinos, elephants, tigers, sharks and other species. The rhino campaign launches fully on Chinese media in March and in Vietnam in April. Much work has already been done, most significantly with WildAid’s celebrity ambassador Yao Ming, the enormously popular Chinese former NBA basketball star. The goal is not to convince an older generation that rhino horn doesn’t work. Multiple studies have shown it has negligible medicinal benefit, though as the conservation group Saving the Rhino points out, it retains “ingrained cultural significance” in many parts of Asia. Rather, WildAid aims to influence younger people in China by making conservation issues “aspirational and inspirational”. For while the newly affluent young may not be using it as a medicine, there is a new risk. Journalist Julian Rademeyer, who spent two years investigating the trade, said he found people “speaking of it as a party drug – often as a hangover cure”. The campaign stresses three key factors: the cruelty of poaching procedures, the existential risk posed to the rhino, and the fact that this is not just a “nature” issue, but a social one. Poaching is a crime that involves the same murderous syndicates involved in drugs, prostitution and people trafficking. And because living rhinos provide huge income opportunities through community ecotourism, their deaths harm local people who rely on foreign tourist income to survive and send their children to school. For China, which has a huge and growing investment presence across Africa, distancing itself from the trade could pay off in terms of positive PR. ‘Our line is not that China is the biggest problem,’ Knights said, ‘but rather that China has a chance to lead’. Will such an approach work? In 2008, WildAid launched a shark fin campaign (also featuring Yao Ming and using the same slogan) during the Beijing Olympics. Some 55 per cent of people recalled seeing the campaign, of whom 82% said they had stopped eating shark fin soup – a legal product – as a result. But with time running out for the rhino, they are going to need an even better success rate this time. This article was originally published on the China Dialogue website.